Former RATT bassist Juan Croucier's Croucier Productions is selling the Jake E. Lee (OZZY OSBOURNE, BADLANDS) master tapes for the original version of Jake's solo record entitled "A Fine Pink Mist". You can now see the listing on eBay at this location ("starting bid" is $15,000). According to Croucier, "These are one-of-a-kind, original studio record masters. 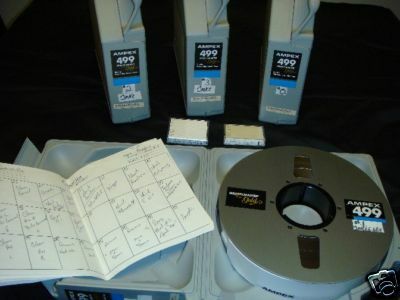 You will own the masters — (4) 2" 24 track analog tapes. Also included are two DAT tapes with rough mixes of the songs (for Juan and Jake), as well as track sheets for the songs. A must-have for any serious rock music collector. This is a very rare piece of rock music history. "Jake E. Lee went on to quickly re-record this record with another producer and studio. The other version of this record was released sometime in 1996 on Pony Canyon. This is the original version of his vision for the record. These tracks were methodically and painstakingly put together before he went overbudget. He used over one hundred individual guitar effects peddles on this record — some of which he built himself. "Jake E. Lee programmed the drums, played bass, rhythm guitars, lead guitars and more. "There is also a bonus track; a cover version of a Jeff Beck song called 'Rice Pudding' that was recorded for a tribute record to Jeff Beck called 'Jeffology' and features Ray Luzier [KORN, DAVID LEE ROTH] on drums and Jake performing all the other instruments. This track was engineered and mixed by Juan Croucier."